Another learner friendly and commuter motorcycle you can add to your shopping list is the Yamaha WR250R. It similar to its predecessor the XT series which is a dual purpose motorcycle hence trail/road focused models rather than than the YZ series which is a genuine Enduro, the WR series variation is designed for more on road use with some genuine off road capability. 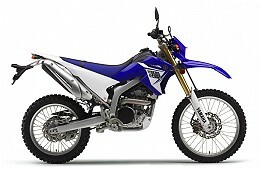 The Yamaha WR250R has been in production for a few years (2008) so parts and reliability have been proven. Also like any motorcycle in this class, has the benefit of being quite durable since they have to handle tough terrain and requisite falling over in a variety of conditions. It was the first in the class to introduce EFI and cemented it’s sales lead and price too (it as the most expensive) It has dropped significantly since the introduction the Honda CRF250 for 2015 which shows how overpriced these bikes where int he first place. Mind you if Honda hadn’t done what they did with the CRF I’d still be saying the same thing. The WR250R key features as I see it, of high ground clearance, light weight, plank like seats and no wind protection means that long distance touring is for people who are reasonably healthy. However a regular city commute would be as good as any other bike. Like all dual purpose motorcycles it is also quite slim and cutting through traffic will be relatively safe thing to do. The WR250 series looks great in the showroom and on the road so that’s really all you need know! If you’re still interested some other things you should consider before getting the Yamaha: One of the biggest problems with the WR250R is that you’ll need long legs due to the seat height, the small fuel tank, relatively expensive to buy and if parking in insecure locations – theft due to desirability. Any dual purpose motorcycle like this is in demand for parts especially. The real biggest problem with the WR250R is it’s price, over $1500 more expensive than the Honda. The latest Yamaha WR250R is a very decent learner and commuter motorcycle if you have the legs for it, literally. If you don’t then the slightly lower seat height on the Honda may be the better motorcycle to buy. Furthermore the Yamaha RRP is $1500 more than the Honda which is hard to justify and essentially WTF territory like the Kawasaki equivalent. Sure Yamaha could charge that sort of money when it was the only one with EFI but not any more and in today’s economic times unless you can get a very good deal or really want the Yamaha.